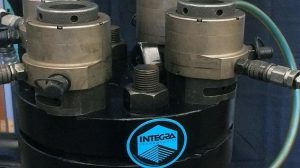 Hydraulic Bolt Tensioning – How It Works from INTEGRA Technologies on Vimeo. Integra Inventories a complete choice of tools for a wide range of bolting needs. For the majority of applications, we recommend Hydraulic Mute-Stud Tensioning. Tensioning gets the job done FASTER, BETTER, and SAFER, thereby minimizing costs and downtime. Additionally, the change of work-related injury is dramatically reduced during flange make-up or breakout. Bolt Tensioning is a totally hands-off operation. It virtually eliminated the danger of pinch-point injuries. 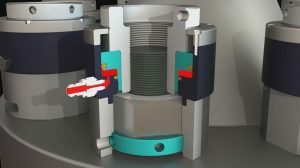 Tensioners are powerfully actuated and controlled with precisely monitored hydraulic power, rather than manual effort. Up to 100% of the flange bolts can be tightened simultaneously to quickly ensure precise and equally distributed clamping pressure. Tensioners are much smaller and lighter to handle, and can be quickly moved into a wide range of positions. Precise hydraulic power is directly supplied to all tensioners simultaneously from the safety of the operator’s console at the pump unit. The tensioners are easily setup and are simultaneously activated through the hydraulic hose network in order to tighten the bolts instantly. Our “know-how” and equipment is highly customized to meet the unique and complex requirements of bolted gasket assemblies such as raised face and ring-type joint flanges, as well as a heat exchanger and manway flanges up to 144 inches. Resource planning and careful operation management ensure the flexibility to mobilize personnel and equipment to meet the customer’s constantly changing requirements and still ensure the highest quality of work and customer satisfaction. Many major plant outages require machining services with a substantial proportion of pipe cutting, weld prepping and heat exchanger face re-facing. 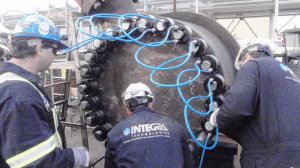 INTEGRA has experienced technicians who can work effectively in and around the confines of boilers and heat exchangers. Special purpose machines are available to suit the wide range of pipe diameters, wall thickness and restricted access areas. 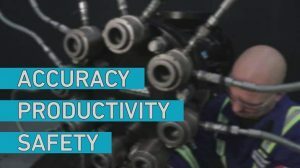 The ability to simultaneously cut and weld prep is advantageous to many applications.